Your source for great cozy mystery ebook recommendations. Sign up for the Cozy Mystery Deals mailing list to get ebook recommendations delivered straight to your inbox. Rachel Rowan wants nothing more than for her father to be happy. So, when he announces his plans to remarry, in theory, she should be happy for him. But that’s not going to happen. After all, his bride-to-be is young enough to be his daughter! And that does not sit well with Rachel. More than just a bit skeptical and uneasy, she is strongly considering whether or not she will even attend the wedding. But when Scott makes a strong case for supporting her father on his big day, she eventually relents. Soon enough, she learns that she’s not the only one who opposes this union. In fact, the two families seem ready to go to war over it! 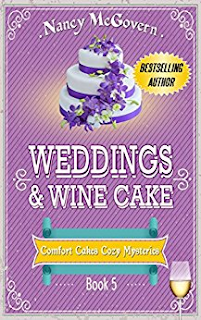 Buy this cozy mystery book right now! www.cozymysterydeals.com is a participant in the Amazon Services LLC Associates Program, an affiliate advertising program designed to provide a means for sites to earn advertising fees by advertising and linking to Amazon.com. Amazon, the Amazon logo, Endless, and the Endless logo are trademarks of Amazon.com, Inc. or its affiliates. Copyright 2018 Cozy Mystery Deals. Simple theme. Theme images by luoman. Powered by Blogger.